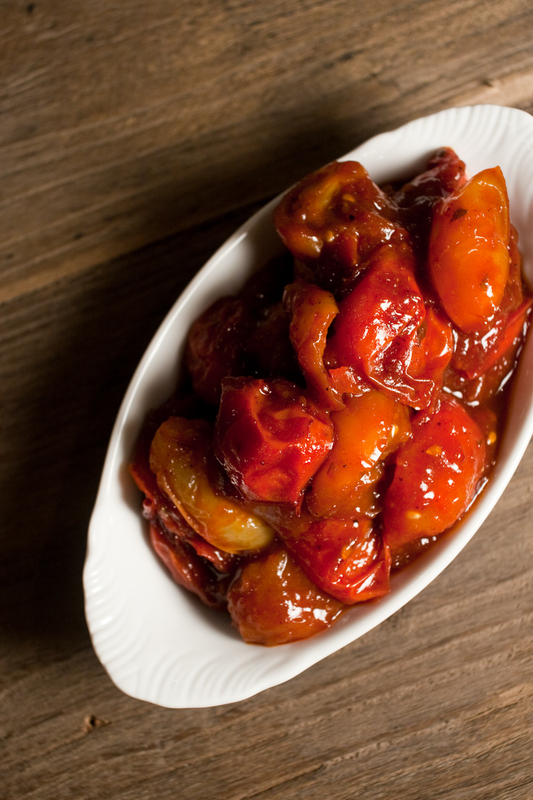 This is the recipe that defines sweet and sour pork for me. Far from small scraps of pork hidden in thick, doughy breading, choked in a gelatinous blend of corn syrup and Red Dye #40, Mom’s recipe is a simple but elegant balance of vinegar and brown sugar, tied together by sweet, acidic pineapple. Earthy soy and the underlying bitterness of green pepper ground the dish, whose flavors are mellowed and bound by rich pork. 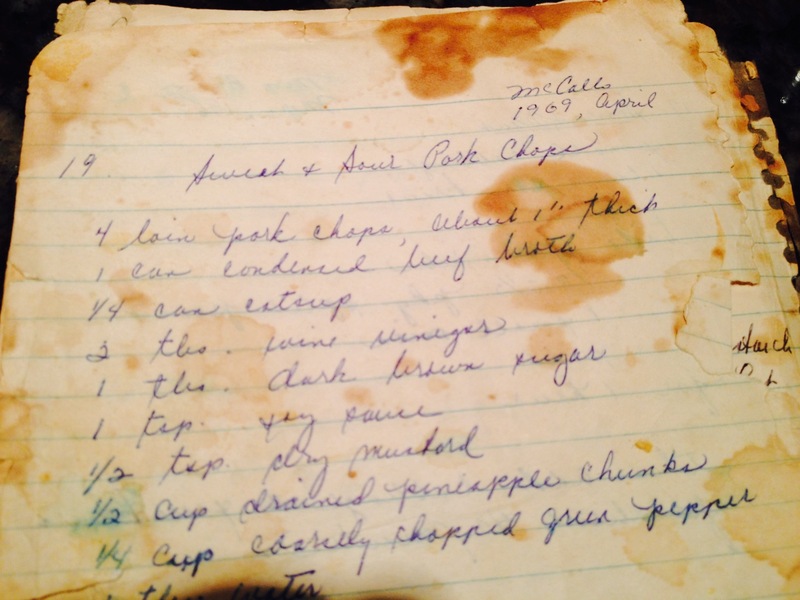 A online scan of 15 sweet and sour pork chop recipes revealed few changes from McCall’s 1969 masterpiece. I dove in, eliminating bottled ketchup and canned stock. 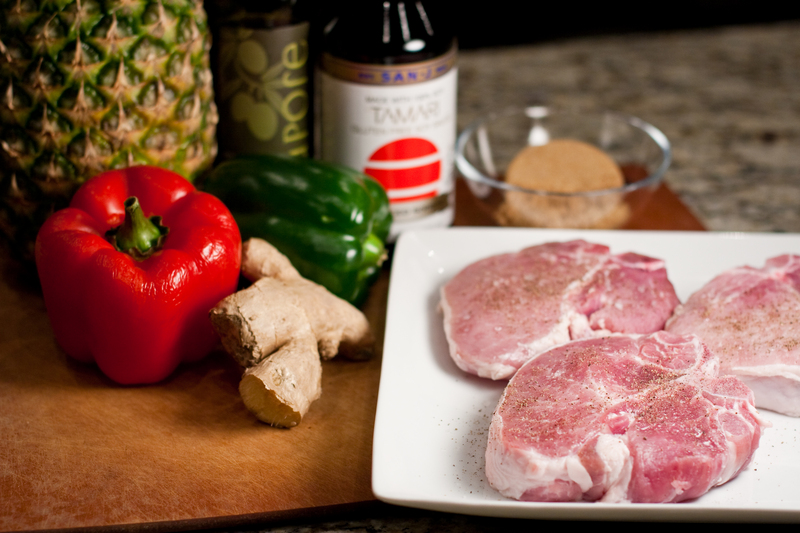 Mild, sweet, white balsamic vinegar and light Temari soy sauce let thick, porterhouse pork chops, fresh pineapple and vegetables shine through. Tapioca starch gently thickens the sauce. It’s a good recipe. Really good. The kind you want to print out and start splattering with food. It should be nicely yellowed in 40 years or so. *Sapore’s Peach vinegar was delicious in this dish! White Balsamic would deliver similar mild acidity with light sweetness. **What’s up with tapioca starch? If you can find, it is a very neutral tasting thickener, not dulling the flavors of the other ingredients. I use it exclusively for fruit and berry pies. Corn starch is a perfectly acceptable substitute. Pat pork chops dry with paper towels. Season both sides with salt and pepper. Whisk together brown sugar, vinegar, soy sauce and chicken stock. Reserve. Heat peanut oil in a large sauté pan over med-high heat. Brown pork chops, about 3 minutes per side. Reserve pork chops. Return pan to medium heat and add onions. Cook 2 minutes until softened. Add red and green peppers and cook 2 minutes longer. Add pineapple and ginger. Cook an additional two minutes. 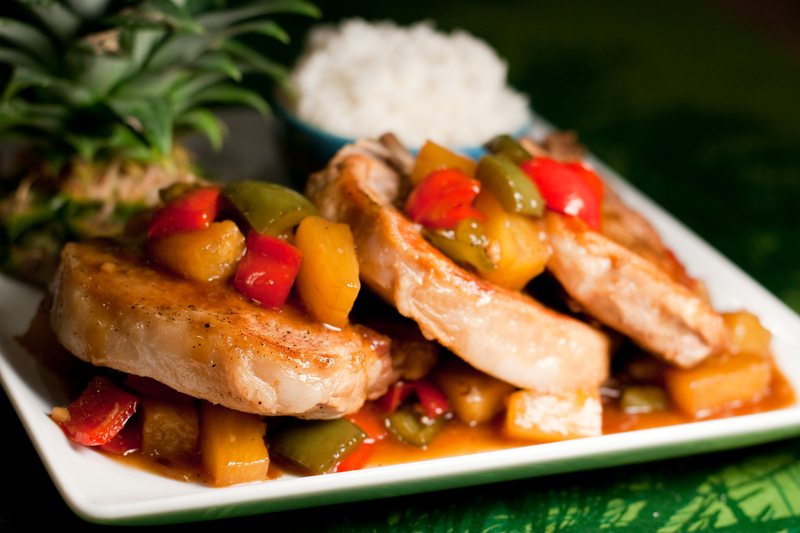 Return pork chops to pan, along with any liquid that has accumulated on the plate, nestling them in the vegetables. Add the sauce and bring to a boil. Reduce heat to low, cover and simmer for 50 minutes. Remove pork chops and vegetables with a slotted spoon. Whisk together tapioca starch with 2 tbs warm water. Add to pan and cook, on med-high, stirring, until sauce thickens. 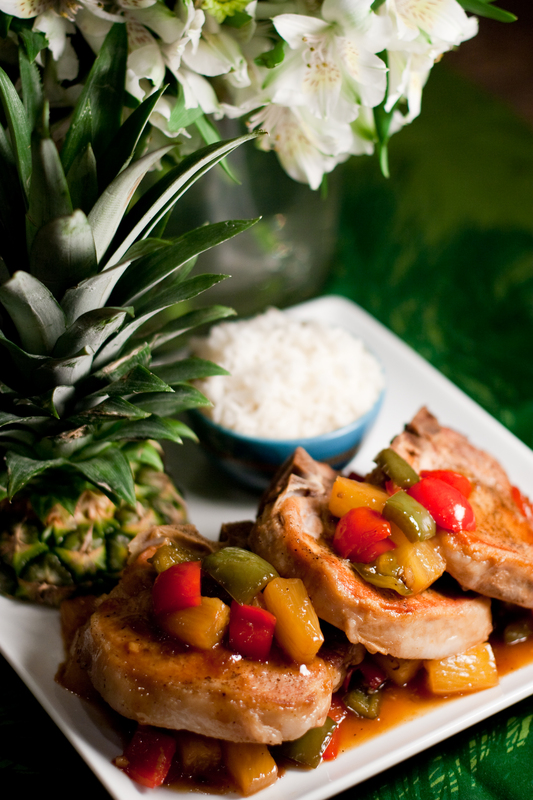 Serve over pork chops, pineapple and vegetables. When I was a kid, fondue was a special family night. Mom would plug in the electric pot full of vegetable oil on the dining room table, as we grabbed for whichever long, two-tined fork was tipped in our favorite color. We cooked cubes of top sirloin in the hot fat, then dipped them into the homemade Béarnaise and burgundy sauces that Mom set out in small bowls. Whether at the end of a fork , skewered with wood for a party or metal for the grill, meat on a stick is one of those foods – like anything smothered in cheese or made with bacon – that leaves us clamoring for more. These kebabs, spicy with Tunisian Harissa – a paste of sun dried chills, sweet with brown sugar, rich with tomato paste and earthy with fresh thyme, are exotic but easy. Oh, and if your fork handles have colored tips, I’ll take the blue. *Pomegranate vinegar is back at Sapore (and it’s delicious!). 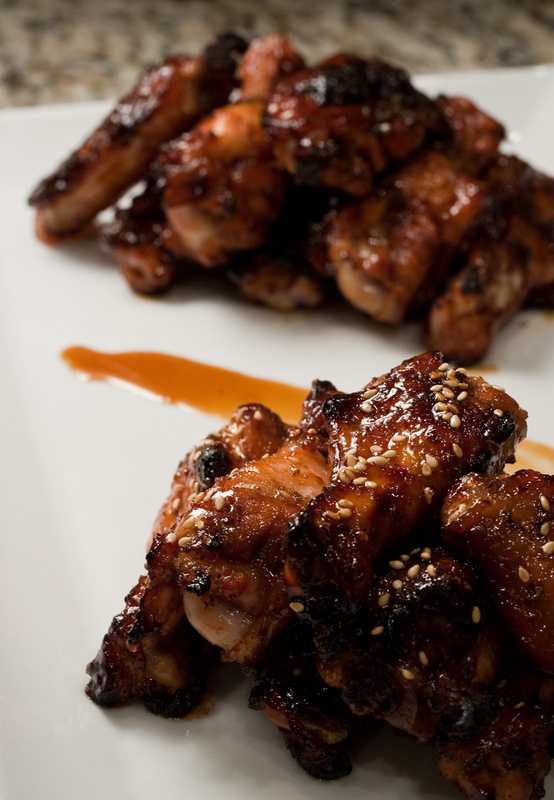 Make marinade: Whisk together Harissa, brown sugar, tomato paste, red wine, Pomegranate Vinegar, cinnamon, thyme and olive oil. Season to taste with salt and pepper. Mix together tomatoes, peppers and steak and toss to coat with marinade. Refrigerate for 2-3 hours. 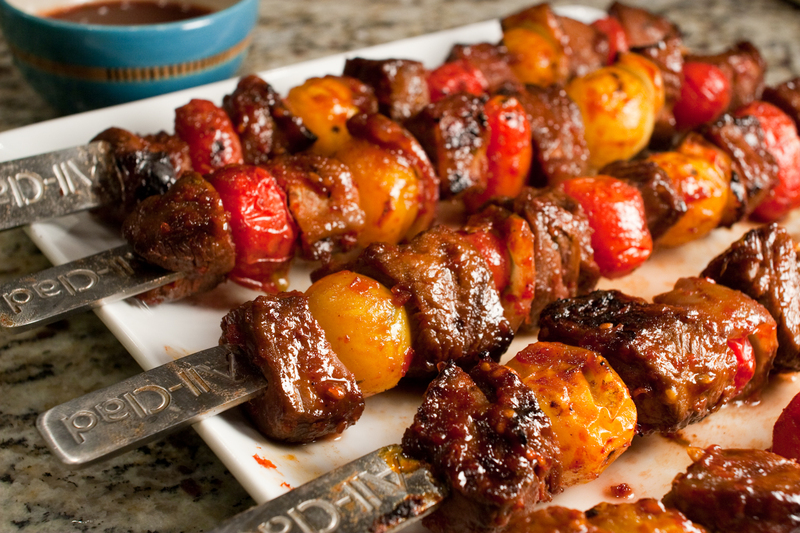 If using wooden skewers, soak them for an hour before grilling. 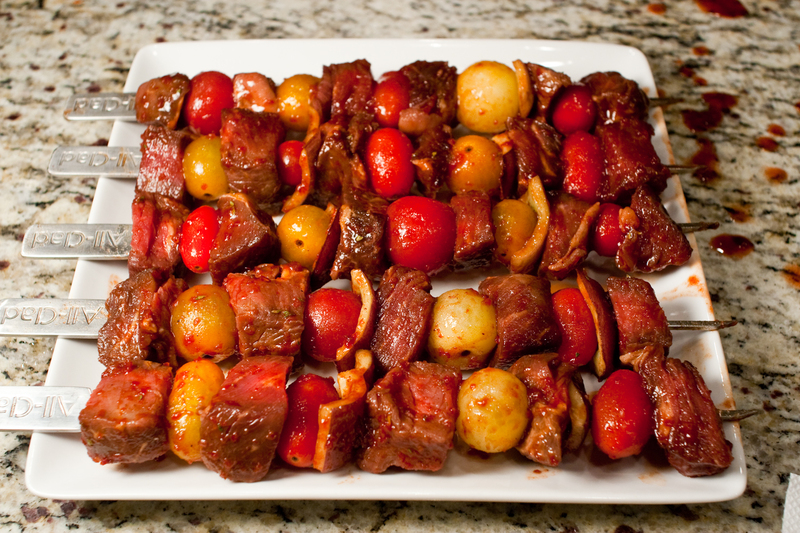 Load skewers with beef, tomatoes, and peppers. Prepare a hot grill and cook over direct heat for 2-3 minutes per side, about 8-10 minutes total for medium rare. 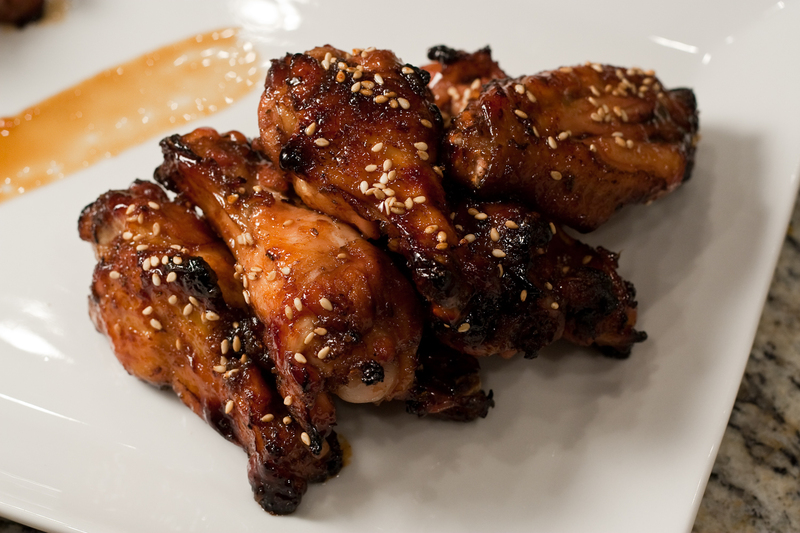 While grilling, place remaining marinade, and any extra tomatoes, in a small saucepan and cook at a high simmer until thickened. Brush cooked kebabs with sauce and serve. When it gets really hot and humid, I get nostalgic, or delirious, about my childhood summers. Without AC, on New England’s hottest summer days we’d jump in a lake or sit in front of a fan (speaking like Darth Vader, of course). Dinner was served cold, following a swim, and dessert was ice cold out of the freezer, usually juice frozen in a popsicle mold. You just rolled your eyes so far back in your head you can see yesterday. This really was my childhood. We really did pick green beans, tomatoes and peppers in the morning. We swam in Pelham or Puffer’s ponds. And no, mom would not get us those sugary frozen tubes of bright blue, red and orange ice, no matter how hard we begged. But she made a mean cucumber salad, and I lived for fried rounds of breaded, egg-dipped squash cut from large zucchinis. I admit, I had it pretty darn good, but I’m still excited to go home to air conditioning tonight. 2 cucumbers, peeled, seeded and thinly sliced. 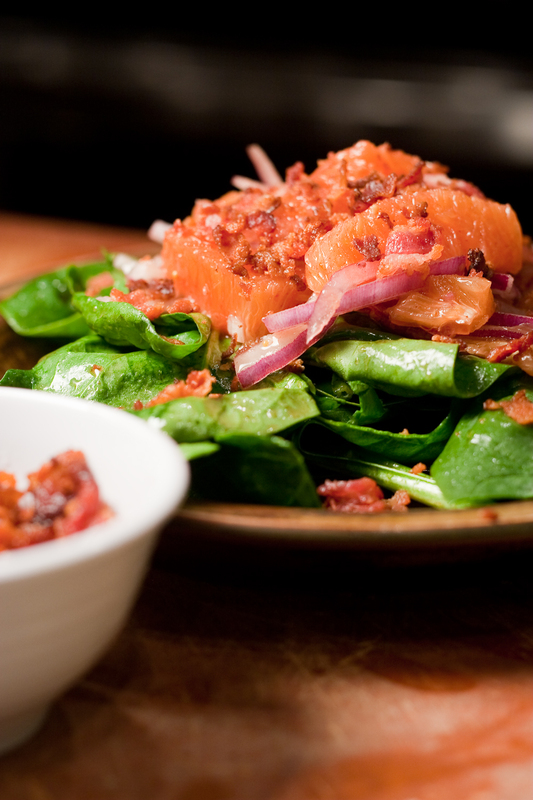 *Sapore’s cool choices for this hot weather salad. Merlot is a beautifully balanced red wine vinegar, not the typical prickly acid-bomb from the grocery store. Arbrosana is bold and green. Buy ’em online. 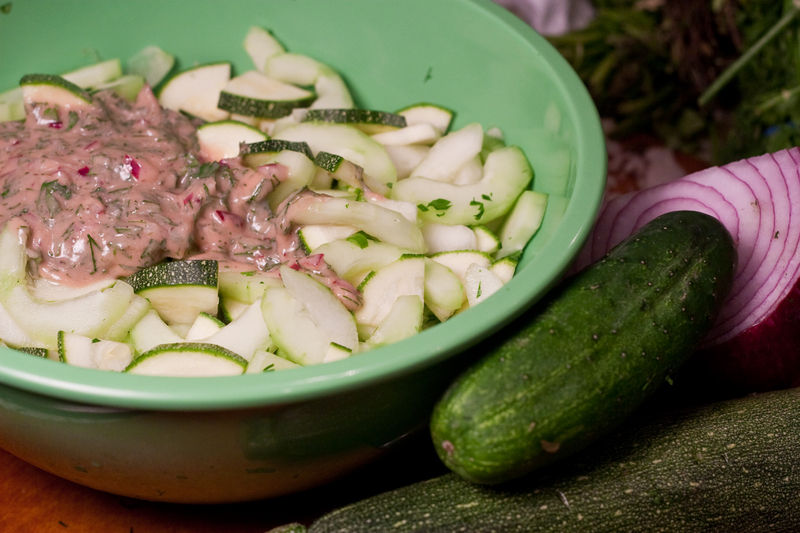 Mix together cucumbers, zucchini and red onion in a large bowl. 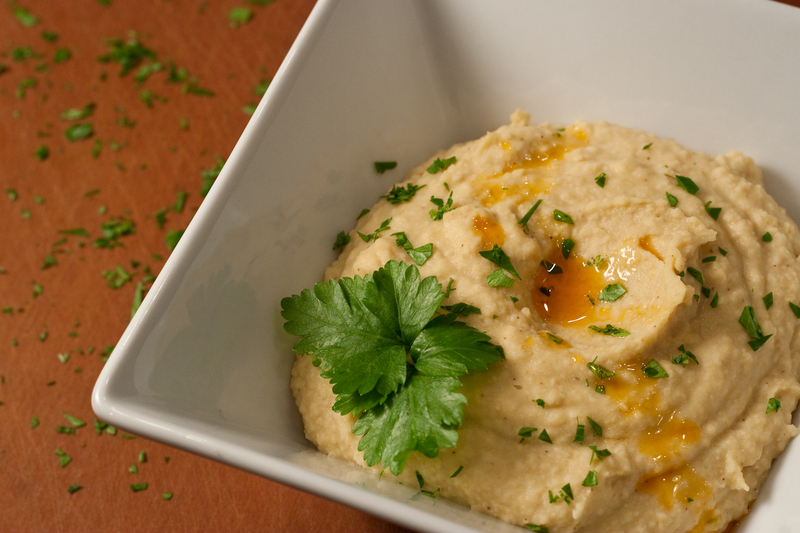 Make dressing: mash garlic and a pinch of coarse salt into a paste. Whisk together garlic paste with Merlot Vinegar and mustard. Whisk oil into dressing in a thin stream to form a creamy emulsion. 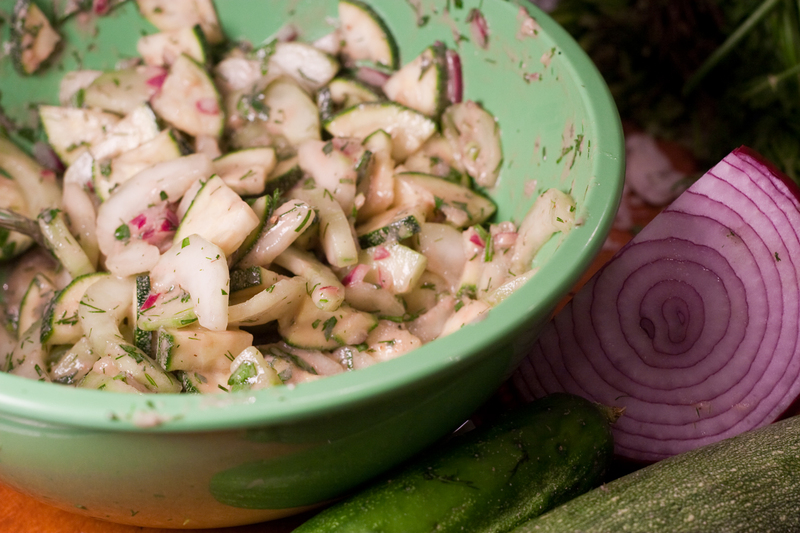 Whisk yogurt into dressing. Fold in herbs and season to taste with salt and pepper. Dress vegetables starting with about 2/3 of the dressing and adding more as needed. Season to taste. If not serving immediately, season to taste before serving. “You’ve got to serve something red, white and blue,” says Valerie, a U.S.Department of State employee by day, farmer on nights and weekends (God, I love DC!). We were discussing the catering menu I was planning in celebration of a friend’s recent citizenship. So, I settled for red and white, 2/3 of the way there. My homage to the salad Oscar Tschirky created for the Waldorf Hotel would have to make up the balance. 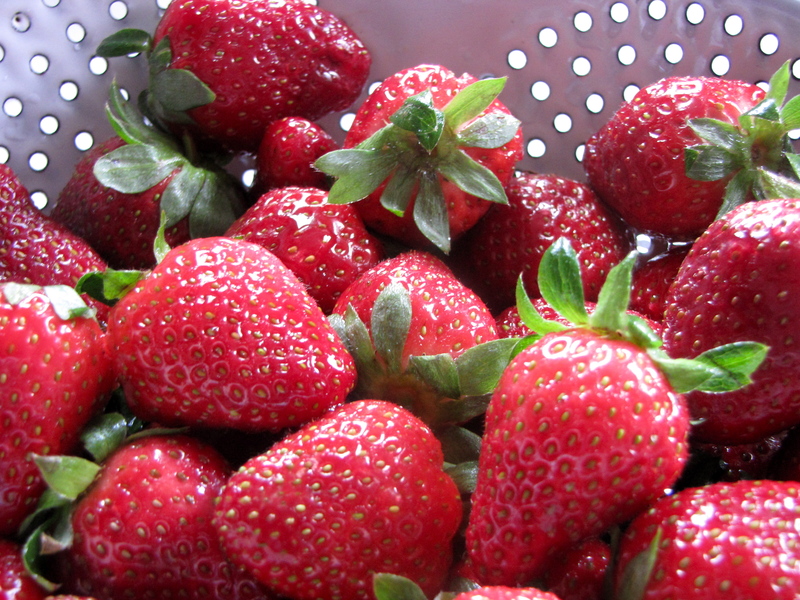 Sweet strawberries replaced apple, while crisp fennel stood in for celery. Toasted pepitas lent warmth in place of walnuts and a sweet, light vinaigrette displaced heavier mayonnaise as the dressing. Add a handful of the June’s first tart-sweet blueberries, and you may just have this season’s superlative summer salad. *We’ve been shopping at Sapore again! A mild tasting oil is important here. Olive oils will overpower the other flavors. Pepitas are raw pumpkin seeds. Smooth and green, you will find them with other packaged nuts, seeds and dried fruits. Substitute toasted sunflower seeds if you can’t find them. Combine shallot, sugar, mustard and salt in a bowl with vinegar. Whisk together. Toast pepitas in a small skillet over medium heat, tossing often to prevent burning. Once you hear them start to pop, toast for a minute longer until at least 1/3 of the seeds are browned on 1 side. 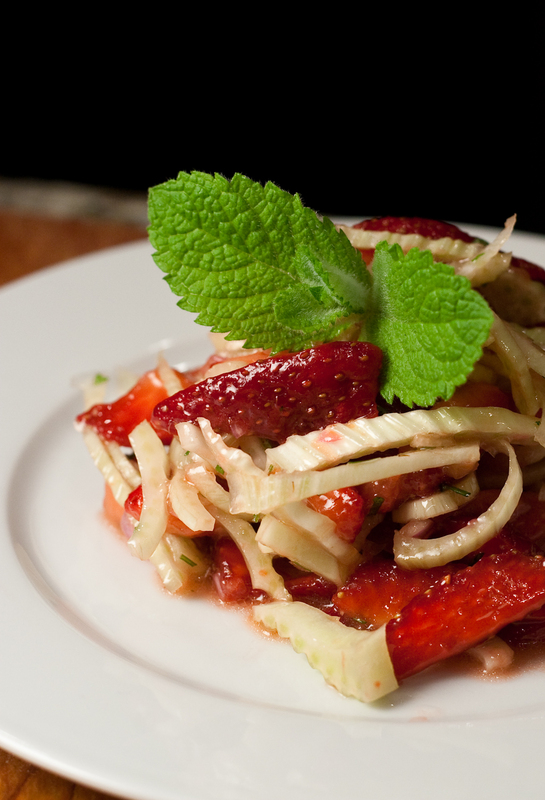 Combine strawberries, fennel, fennel fronds and mint in a separate bowl. Toss together. Whisk oil into dressing to form a creamy emulsion. Season dressing to taste and toss with salad. Can be served alone or over greens like baby spinach or butter lettuce. I blame bacon. Amish bacon. You see, until last week, I was living in a beautiful fantasy world where people came to my Eastern Market demos each week to taste new, farm-fresh, seasonal ingredients. We were learning new foods, new recipes and new techniques together. But it was all a lie. But, Mom and Dad didn’t raise a quitter. So sorry folks, you’re just going to have to suffer through asparagus soup with mushroom spaetzle this week. As my Dad used to tell me, “People in hell want ice water.” And, apparently, bacon. This is not the salad to use baby spinach for. The hot vinaigrette will wilt it right down into soup. Buy grown-up spinach with good substance to the leaves. Yum! No Cabernet Sauvignon jam in the fridge, bust out just about any jam with this salad from tart beach plum or cherry to acidic orange marmalade. *You can find Roasted Red Pepper Blackberry Vinegar at Washington, DC’s Sapore Oil and Vinegar. Stop by or order online. I love it and easily go through a bottle a month. Warm oil in a 10” skillet over medium-high heat. Brown bacon and remove with a slotted spoon, leaving behind rendered fat. Add diced onion, reduce heat to medium and sauté until softened, about 2 minutes. Add Cabernet Sauvignon jam and mustard and cook, stirring, until jam liquifies and liquid reduces by half. Add vinegar and whisk until vinaigrette comes together and thickens. 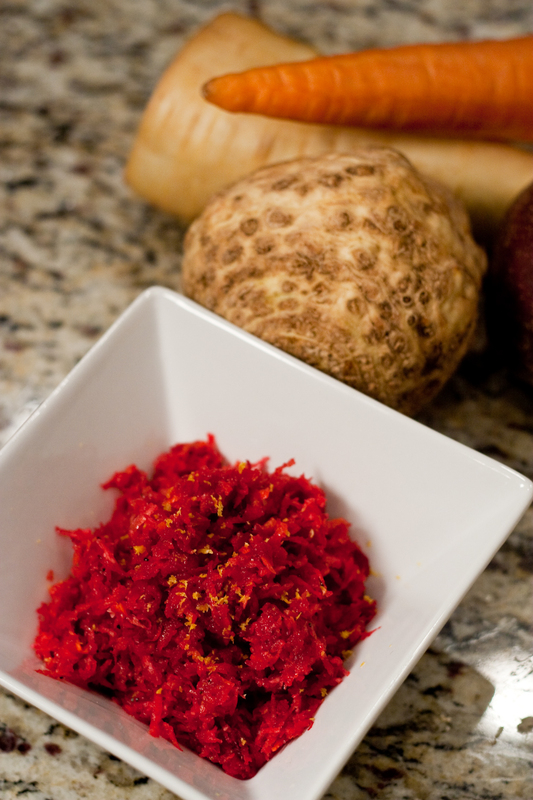 Season vinaigrette to taste with salt, pepper and Habañero or other hot chile powder. 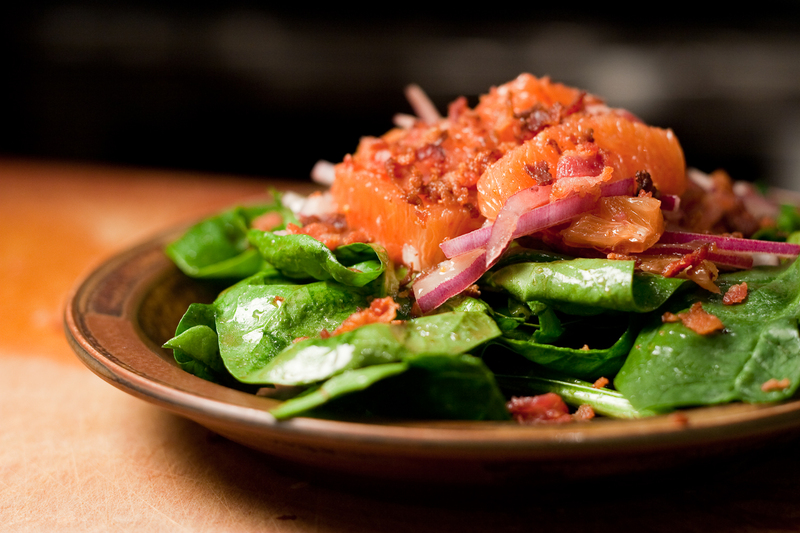 Toss spinach, sliced onion and oranges with vinaigrette and serve. If you want this to look extra special for guests, dress the onions and orange sections in a separate bowl and plate on top of the dressed spinach. The root of the problem. A beetroot salad, in British television, seems to be shorthand for punishment or penance. However, faced with a spring season where the calendar had gotten far out ahead of the weather, that’s precisely what we made. Cold days had prevented the emergence of sweet asparagus or spring onions, so we sat in the test kitchen staring at winter storage celeriac, parsnips, carrots and beetroot. They seemed more suited to a fall roast tossed with thyme than a light spring salad. Our first decision was to serve them raw, the second was a light poppyseed vinaigrette. 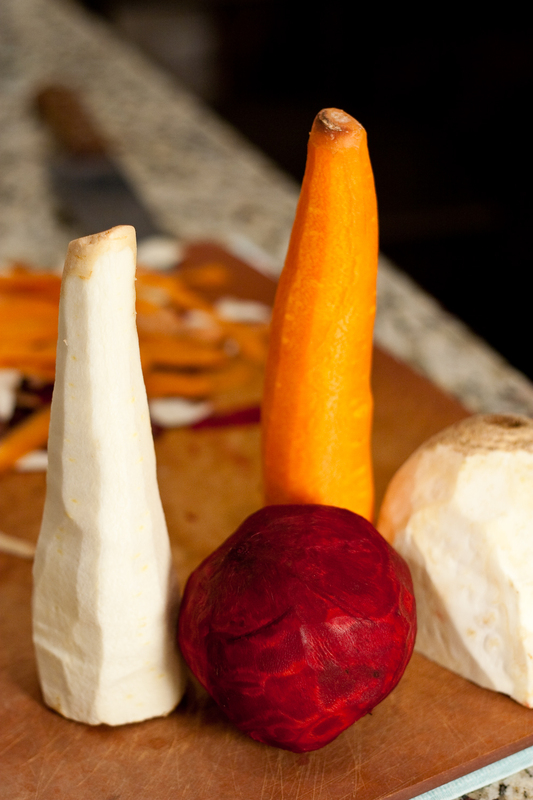 Shaving them thin on the smallest side of our box grater eliminated thick , tough shreds of fibrous root vegetables. With the grater already out, we grated onion rather than dairy to thicken our dressing. Faced with several vinegars, Sam, part of our #testkitchen crew, selected a mildly acidic, slightly sweet Autumn Apple from Sapore. It was the perfect choice. Winter never tasted so much like spring. *Yes, this blog post title is a terrible pun. If one of you had brought me more coffee it could have been avoided. The beets turn the rest of the vegetables a beautiful bright ruby color. *Autumn Apple vinegar is available in DC or online at Sapore. Commonly available cider vinegars tend to be bitter and acidic. Sherry vinegar would be a closer match to the autumn apple. Toss together grated vegetables in a large bowl. Make dressing: whisk together onion, dry mustard, paprika, poppy seeds, honey and Autumn Apple vinegar with a pinch of salt and pepper. Dress slaw and let rest 10-20 minutes before serving to let flavors develop. These vegetables are bold and heavy, so add a little more dressing than you would to fresh greens. Serve topped with grated lemon zest.